Finally! No More Do-It-Yourself Mailing, 4OVER4.COM takes care of your direct mailing needs with a quick and simple order, without waiting around for pricing adjustments or checks to clear. Simply select your product, size and send us your list- we’ll take care of the entire process for you. *For Folded Pieces Only (i.e. 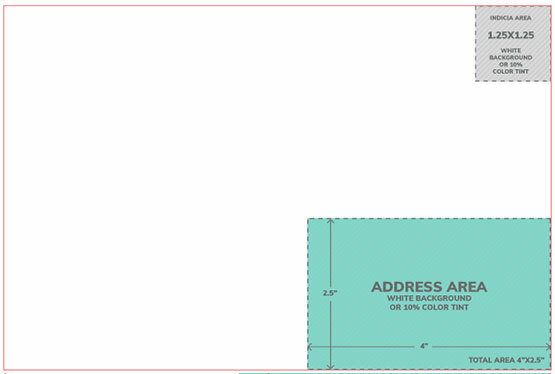 : 8.5” x 11” trifold), double tabbing or wafer sealing is required by USPS. Additional fee for “double tabbing” as shown on the table above applies. Postcards & Flat Prints Are Not Subject to this Fee. First-Class: 1-4 business days for arrival. Disclaimer: Prices valid only for "PRESORTED AUTOMATION", therefore the layout of the backside mailing panel must meet USPS Automation Design Guidelines. See our FAQs for more. What is the Difference Between First Class and Standard? How to Choose Between First Class and Standard Rate Mailing? Choose the class that best suits your budget and project delivery time. You can expect Standard Mail delivery typically in 10-15 days, so if you have a rapidly approaching event or expiration date in your promotion NEVER choose Standard Mail. Standard Mail is less expensive in postage, so this option might be suitable for your needs if you have enough time for your promotion. However please note that standard mail not only takes longer, but it is also not forwarded and not returned if “undeliverable”. It merely goes into the USPS recycling bin. If you have a time sensitive project choose First Class Mail which delivers typically within 1-4 business days and automatically includes return service for undeliverable addresses at no charge, specifically: if your party has moved, for a period of 1 year OR if it’s undeliverable, it will be returned to you, again at no charge, with the reason for non-delivery. What is included in 4OVER4.COM’s Direct Mailing services? 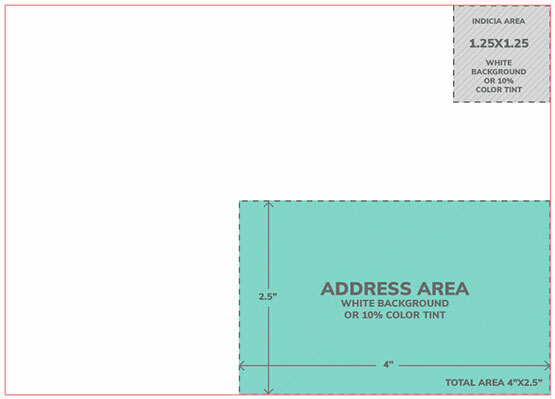 What are the minimum pieces required for mailing? How much is the Direct Mailing Service charge? The direct mailing service charge is based on the quantity of your mailing order and you’ll be able to calculate it using our convenient Instant Price Calculator. What is the turnaround for direct mailing? 500 - 25,000 1 - 3 business days. 30,000 - 60,000 3 - 5 business days. 70,000 - 100,000 5 - 7 business days. 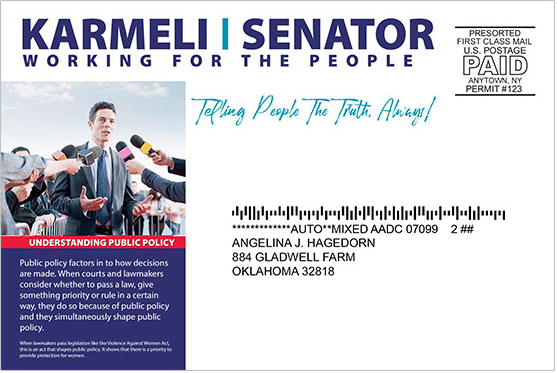 Calculate your campaign's launch time adding the print turnaround to the estimated Direct Mailing time above, according to the number of pieces printed. No, postage is a separate charge; you’ll be able to calculate it online with our Instant Price Calculator. Bear in mind our postage rates are for FULL AUTOMATION according to USPS guidelines, however with 4OVER4.COM you save even on NON-AUTOMATION projects, when compared to the postage rates the USPS gives you, if you mail with them directly. Do You Offer Direct Mailing for Nonprofits? Yes we do! Iif you have a Non-Profit account with USPS, please provide a completed Non-Profit 3623 Form and double-check your information to ensure all data is correct. You can download the form here. 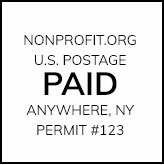 If you’re mailing as a Non-profit it is critical that you make sure that the name and address of the Non Profit used as the return address on your print matches the one in the 3623 Form. Mailing services are charged with your order and are processed exactly as other non direct mailing orders are, that is, once you have Approved your prints and order your card will be charged and the transaction will be completed. 4OVER4.COM will take care of mailing your prints and dispose or ship remainders to you as specified in your order. 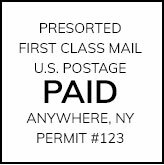 Postage is paid along with the printing cost and shipping cost (if applicable), after you approve your order. Bear in mind our postage rates are for FULL AUTOMATION according to USPS guidelines, however with 4OVER4.COM you save even on NON-AUTOMATION projects, when compared to the postage rates the USPS gives you, if you mail with them directly. What happens if my artwork doesn't qualify for Presorted Automation? Let's avoid that from happening ! 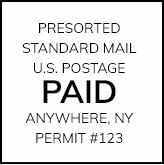 To benefit from the maximum amount of postal discounts, make sure to leave us the blank 2.5" x 4" address area the USPS asks for and a blank 1.25 x 1.25 area in the top right corner for the postal indicia. That's it! 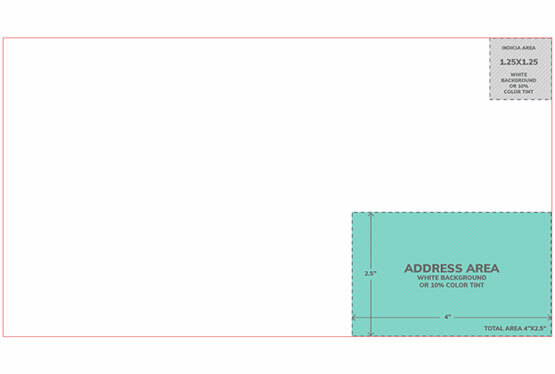 As you can see above, USPS requires a 1.25” X 1.25” indicia area and a 2.5" x 4" addressing area. In most cases this is not a problem as the print area is much larger than the indicia and addressing area combined; however, when printing on 4”X6” postcards a significant portion of the card must be reserved for addressing and indicia. If your artwork doesn’t meet the USPS Automation criteria, you will be charged USPS non-automation rates. Your pricing will be adjusted if your artwork fails Automation. Either way, without 4OVER4.COM handling your direct mail, you pay 0.35 cents for 4”x6” postcard and 0.50 cents to mail any other size. Save with 4OVER4.COM on all sizes and on Automation and Non-Automation jobs! Can we use our own permit instead of 4OVER4.COM's? No, mailing service is only offered to customers that want to use 4OVER4.COM’s permit. Can I send you my prints and you handle the direct mailing service for me? No, mailing service can only be done with jobs printed by 4OVER4.COM. We cannot address or tab jobs done by other printers as well. What are the acceptable file types for mailing lists? 500 pieces required to qualify for Presort Standard. Post office delivery time is estimated 1 - 4business days. Uses customer's Non-Profit account with 4OVER4.COM’S permit number. 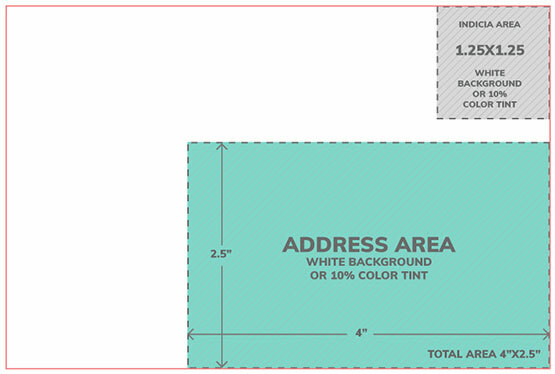 USPS requires a standard 1.25”X1.25” Indicia area and a 4”X2.5” addresing area. 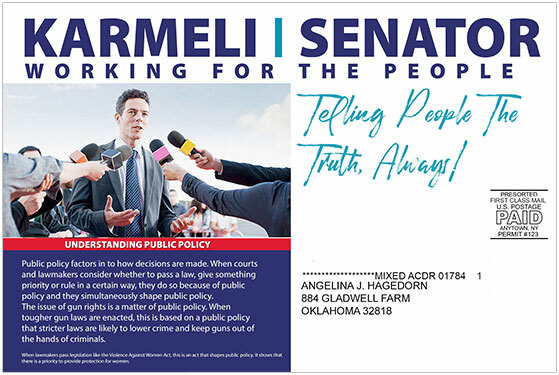 In most cases this is not a problem as the print area is much larger than the indicia and addressing area combined; however, when printing on 4”X6” postcards a significant portion of the card must be reserved for addressing and indicia. If you want your artwork to qualify for Presorted Automation please make sure you follow the guidelines below. Templates can also be downloaded by clicking here to get a print-ready blank template for your artwork, that already meets USPS Automation standards.